Soak the gelatin in iced water for 20 minutes. Bring the milk to a boil, then add the gelatin. Break the chocolate into a bowl, pour the mixture on top, and blend until frothy. Bring the cream to a boil, melt the gelatin into it, then add to the chocolate in a large bowl. Mix together and let the mixture cool. Beat the egg whites together with the sugar until they form soft peaks. Gently blend the two mixtures, being careful not to collapse the beaten egg whites. Divide the mixture into five glasses, placing half a coffee-soaked ladyfinger in the bottom of each glass. Fill half of the glass with mousse, then top with the other half of the ladyfinger. Mix together all the cold ingredients, then carefully add the melted butter. Chill for 1 hour. Spread on a baking sheet and cook at 360°F–390°F (180°C–200°C) for 8–10 minutes. When cooled, break into tiles. To serve, pour the chocolate froth into the glasses, on top of the mousse and ladyfingers. 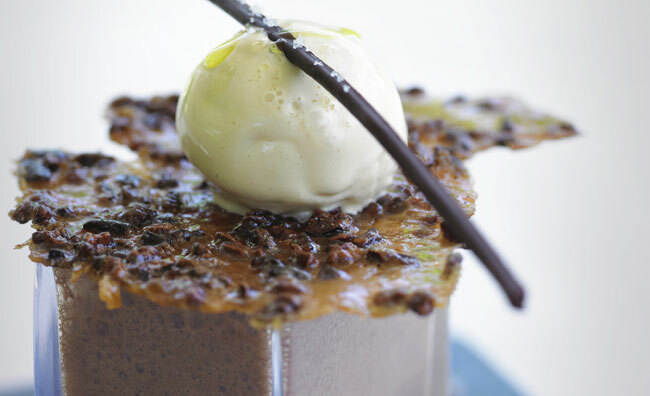 Place a tile of brittle on top of each mousse,along with a scoop of caramel ice cream.